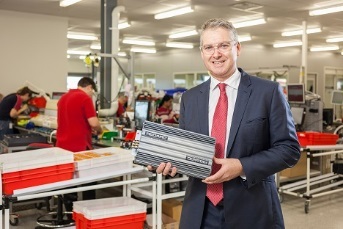 REDARC, an Aussie manufacturer of electronic voltage converters and associated products, based in Lonsdale, South Australia, has snatched the 2014 Telstra South Australian Business of the Year at this year’s Telstra Awards. The Telstra Australian Business Awards have been recognising Australian business since 1992, celebrating the entrepreneurs and innovators of Australia. According to the news release by REDARC, the award was presented by the South Australian Treasurer and Minister for Small Business Tom Koutsantonis at the Adelaide Entertainment Centre last week. “All the winners are brilliant and inspirational businesses whose owners are recognised for their professionalism, innovation, leadership and creative use of technology. REDARC is an outstanding family-owned technology business that has dynamic leadership and a strong culture of core values and ethics. It designs and manufactures a patented range of high value-add electronics products and invests throughout its business in its products, people, processes and systems,” said Will Irving, Telstra Business Group Managing Director and Ambassador for the Telstra Australian Business Awards. The company is a research and development-driven manufacturer of patented battery charging, portable solar, electronic safety and voltage convertor products with 95 employees at its Lonsdale plant. “Our entire model is based on innovation – we put technological development at the forefront of everything we do. Our products can be fitted to anything with a battery that moves. Our success has come from an unrelenting focus on new product development, employing and developing highly skilled people and providing excellent technical and after sales customer support. We continually invest at least 15 per cent of our revenue back into R&D and also make a significant investment in staff training,” said Anthony Kittel, owner of REDARC. In 2005, REDARC spent the equivalent of its turnover in building a new factory and the risk paid off. “We established a magnificent facility, bucking the downward trend in manufacturing,” Mr Kittel said. “Telstra Awards judges said REDARC, also the Medium Business Award winner, demonstrated a strong commitment to manufacturing in South Australia and continued to grow and innovate over many years,” Mr Irving said. According to the news release by Telstra, the winners of the 2014 state, territory and national Telstra Business Awards will share over $800,000 in prizes and will progress to the Telstra Australian Business Awards which will be announced in Melbourne on 7 August 2014. 2015 Nominations are open. Entries for the Awards will open again February 2015.